Life is short, so make it eventful. Those are not my words but those of our first site, which offers a great way to keep up with what is happening in your neck of the woods and even demand that things should be happening if they are not. The aim of Eventful is to be a global and local one-stop-shop events calendar. Click on the "My Eventful" tab at the top of the page to register. It is free and once you have done this you will be able to customise the site and subscribe to an e-mail service to keep you up-to-date with any new events happening in your area. If you are an organiser the "Events" tab allows you to create an event so you can tell the world what you have planned. There is a social side to the site, too. You can chat with other users and add them to your friends list. So if you have ever said to someone "You just had to be there," now you can find someone who was. A nice addition to the site is the "Demand" tab which allows you to demand that an event takes place. More than 2,000 fans of the rock group Korn want them to play in Latvia's capital city Riga, for example. The idea is that if enough people want an event it might actually take place. 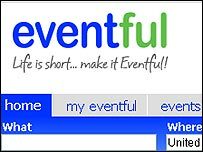 Eventful does not have listings for every city - while the US is pretty well covered, I found nothing listed for Brisbane or Zurich, but there were lots of events for larger cities like Sydney and Berlin. If you like discovering new music Pitchfork is a real gem. Brand new videos and downloads abound on this picture-rich Flash-enabled website, so if you do not have Flash running on your computer you need to get it. 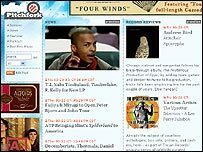 The busy homepage is in the style of a magazine, with columns of news, reviews, features and free tracks to stream from the latest releases. The search bar in the top left lets you seek out specific bands, with links beneath it to specific areas of the site. But while it is a virtual smorgasboard of media content, navigation on this site can be a little annoying. The pages are typically quite long, with each feature or write-up presented in full so there is lots of scrolling down when browsing. However, the reviews are witty and incisive and peppered with MP3 tracks, with the occasional music video thrown in for good measure. "A Pop Idol site for artists now." That is how viewer, David Campbell from Brighton describes the site he has helped set up and sent into Click. Seeking Picasso is a place where artists can show off their work to the public, who become the judges, voting who should stay and who should go until an ultimate winner is found. 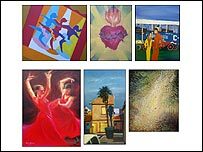 Each week presents a different theme on which the 12 artists chosen to enter the competition have to deliver an artwork based upon. The works can be viewed using the gallery link from the main page. The first week's theme was Excess and there were some thought-provoking, colourful and funny takes on the same subject. The artworks are available to buy and it is this money which in part then helps fund the prize for the winner. It is a lovely idea to get people talking about art and one that could be set up anywhere. This competition was only open to artists in Brighton but David hopes to start up a nationwide one later in the year. So this is a taster of perhaps something bigger to come, and that is very much the feel of this site. It is quite small, pages take some time to load, and certain links - like those in the Education section - are not active. The hope is that artists will send in articles, reviews, and papers to help fill out these areas to make the site feel more like a resource as well as a competition. If you are a Lego fan, here is a site that you will find invaluable, especially if you are one of those people (like me) who do not bother with the manual and then think "Hmm, that doesn't look right, where are those instructions?" Brickfactory is basically an inventory of just about every Lego set produced since 1958. 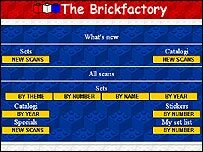 The simple layout on the front page allows you to search these colourful brick sets by number, theme, name or the year it was made, and once you have found the set you are after, click on the box image to reveal the list of instructions on how to build it. Simple! There is a link to an FTP site from where you can download the information. There are also scans of stickers and brochures to peruse.